The best thing was the sheer joy Joni Mitchell still seemed to take in performing, reviving a career she herself had long pronounced done, writes The Star's Richard Ouzounian. 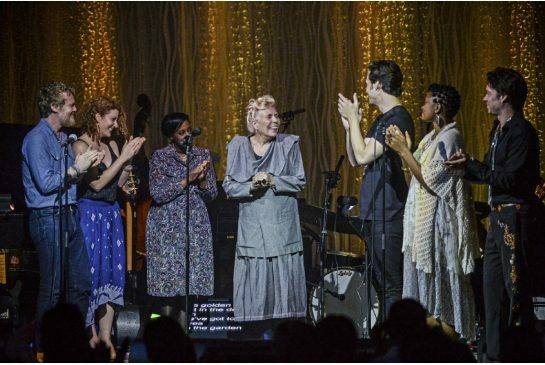 If you had to describe Joni: a Portrait in Song, the "birthday happening" that the Luminato Festival presented in honour of Joni Mitchell on Tuesday night, you would need three words: astonishment, celebration and discovery. Astonishment was hearing Mitchell raise her voice in song for the first time in many years, surprising and thrilling the capacity crowd, with a trio of songs, culminating in a throaty but heartfelt rendition of Woodstock that found her beaming with delight and the audience positively ecstatic. Next was celebration, of course, to mark the sheer joy of an audience who assembled to hear the work of a woman whose songs they had loved for nearly 50 years and the boundless enthusiasm of a company of great artists who dug deep inside themselves to salute an even greater one. But the most astonishing part of this evening constructed by Artistic Director Jorn Weisbrodt, Producer Danny Kapillian and Musical Directors Brian Blade and Jon Cowherd was the sense of discovery. We heard Mitchell songs both familiar and obscure, but besides a flash of recognition, we also had the thrill of hearing numbers emerge newborn. Lizz Wright's a cappella rendition of The Fiddle And The Drum which began the evening reminded us of Mitchell the folk heroine to be sure, but also alerted us to the fact that her social conscience has also been razor sharp. After all, she's the woman who used Woodstock to tell us that "We've got to get ourselves back to the garden." By the same token, the Oscar and Tony Award-winning composer of Once, Glen Hansard, tossed aside his folky roots and gave us a searingly edgy rendition of Coyote, with its repeated lines about being "a prisoner of the white lines on the highway." The intense Liam Titcomb blasted through one of Mitchell's final songs (to date), her setting of Rudyard Kipling's If with a deep passion and Cold Specks brought an authentically dark vision to Black Crow. Kathleen Edwards favoured us with Mitchell light and dark, but worked to best effect when her acoustic version of Big Yellow Taxi encouraged us all to sing the tag line "Don't it always seem to go that you don't know what you've got till it's gone?" The best part of this evening was realizing that with Mitchell there in our midst we knew what we had and she was still with us. Mitchell has often called herself "the only black man at the party," but last night proved she was also the only gay man as well, when Rufus Wainwright, splendidly spangled, took two of the songs from Blue and made them spectacularly his own. After confessing that his mother, the late Kate McGarrigle, was "just a little bit jealous of Joni Mitchell" and that's why he came late to her work, he made up for lost time. All I Want, with a Latin backbeat, evoked the shade of Peter Allen splendidly, while A Case Of You with its snappy repartee (If you want me I'll be in the bar,") and masochistic revelling in the pain of love couldn't have fit Wainwright more securely if he had written it himself. The discoveries and the joys kept coming all night. Not every song hit the bull's-eye, but enough did to make the evening count as a solid success. When Wainwright reinterpreted Slouching Towards Bethlehem as "a Scottish folksong" it was as brave as it was triumphant and by the time Mitchell herself took the stage, everyone was primed for the moment. The best thing was the sheer joy Mitchell still seemed to take in performing, reviving a career she herself had long pronounced done. If Luminato does nothing else (and believe it has a lot to its credit so far! ), uniting Mitchell with an audience again may rank as its finest achievement to date. "Every picture has its shadows," she wrote, "and some source of light." That's what's made her writing so enduring. For such splendid suffering, such illuminating darkness and such pleasurable pain, we thank you, Joni Mitchell. This article has been viewed 3,606 times since being added on June 19, 2013.